If you are looking for an eye catching, colourful and incredibly fun activity then Wonderland Croquet could be the one! Our Wonderland Croquet is unique and custom made for Pick ‘n’ Mix Events. 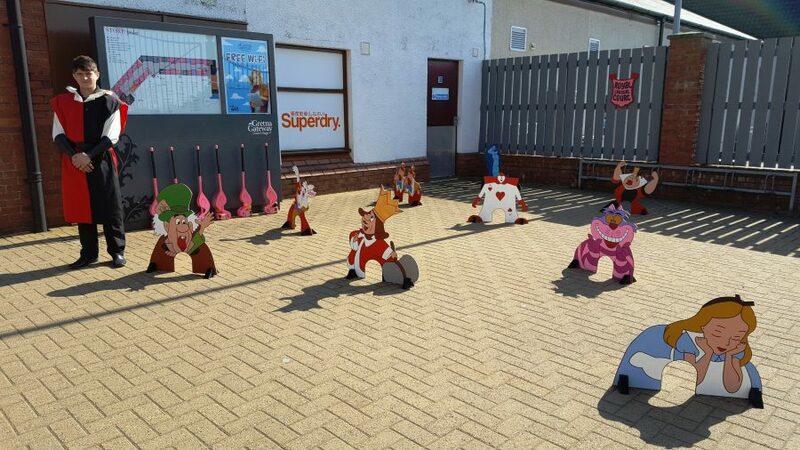 With nine large wooden characters to create the perfect croquet course, your visitors really will feel as though they are in a magical Wonderland! Of course Wonderland Croquet would not be complete without a flamingo mallet…and we have six of them, each with a colourful wooden ball! Our lightweight, easy to use Flamingo Mallets make our croquet the perfect game for people visitors of all ages – from young children to grandparents. Our waterproof wooden characters allow the Croquet to be played outside as well as inside. It’s also suitable for both hard surfaces and grassed areas. To ensure the safety and well-being of your visitors Wonderland Croquet is provided with a fully trained activity supervisor. For no extra cost we can provide one of the ‘Queen of Hearts Guards’ instead! Each character measures approximately 2ft x 2ft, is made from MDF and hand painted to an exceptional high standard. One game of Croquet will last for approximately 10-15 minutes. This makes it a great activity to increase your visitor dwell time. Should you be interested in charging your visitors a ‘pay-per-go’ then we would recommend a fee of £2 per person. A maximum of six people can play Croquet at any one time. Alice in Wonderland is a great alternative event theme to a traditional Easter or summer event. As one of our most popular themes, we provide many Alice in Wonderland themed events throughout the year. With Wonderland themed Crazy Golf, Magical Dress Up, Story Teller, Tea Parties, Craft Workshops, Characters and much more. We can provide an event as large or as small as you would like. To create an even more magical atmosphere why not hire some of our Alice in Wonderland themed event props and decor as well? We have giant wooden character and playing card props, artificial roses and plants, over-sized tea sets, peep-through-boards and much more! Our expert event designers can even set up and display the props to create the perfect Alice in Wonderland setting for all your visitors to enjoy and remember. If you would like further information or to hire our Wonderland Croquet and themed activities feel free to contact us on 07926055523. Our friendly team would love to talk to you!